The root cause of this confrontation is imperialism’s determination to force a pro-Western orientation on to the whole of Ukraine, when around half the population opposes this and supports an orientation towards Russia. The US and the EU each contributed significant resources to the overthrow of Ukraine’s previous non-aligned regime. The EU wanted to draw Ukraine into its economic orbit and was prepared to compromise on the country’s military neutrality. But the US overruled the EU as its goal is to end Ukrainian neutrality and absorb it in NATO – expanding the NATO alliance along the borders of Russia itself. How these forces interacted in preparing and supporting February’s parliamentary coup is outlined in this article here. However this project faces widespread opposition across Ukraine’s east and south. In these regions significant forces have refused to recognise the ‘interim’ government in Kiev, and have stepped up their agitation for a neutral, federal Ukraine, with substantial autonomy for the eastern and southern provinces. Or, if this is refused, to secede and re-join Russia. The political division within the country reflects the different historical and cultural roots of its east and west. 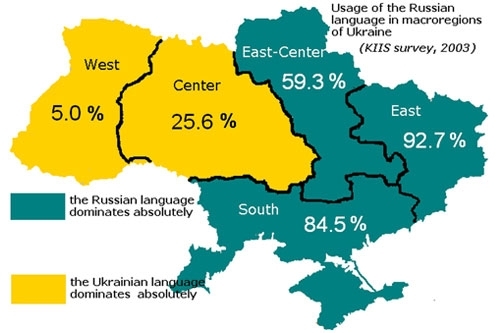 In the east the large majority are Russian speaking; some identify as Russian nationals others as Ukrainian Russians; all strongly defend their Russian cultural and language rights. The industrial belt of the Donbas developed as an integral part of the Russian economy and its trade and investment relations are overwhelmingly with Russia. As a result, the eastern population hugely favours an economic and foreign policy orientation towards Russia and strongly opposes joining NATO or any similar steps which are viewed – correctly – as shifting Ukraine towards an anti-Russian position. The previous position of Ukraine – of formal neutrality between NATO and Russia – could keep both sections of the population united. The attempt to force through a pro-NATO, pro-EU position has divided the country. Almost immediately, in March it led to Crimea seceding and re-joining Russia. Elsewhere, across the south and east, weeks of anti-coup demonstrations have been followed by the occupations of government buildings, including in the cities of Kharkov, Slaviansk, Krasnyi Liman, Kramatorsk, Lugansk, Enakievo, Gorlovka, Donetsk, Khartsyzk, Ilovaisk, Mariupol, and Druzhkovka. Protestors are barricaded in to regional government and police buildings, some are armed, and all are demanding a federal Ukraine with substantial regional autonomy. Some are calling for referendums on joining Russia. The new pro-Western regime has threatened to use force to evict the protesters and has sent army units to the eastern cities saying they will put down the protests. However, so far a frontal offensive has not materialised. Kiev’s forces did reportedly fire on protesters at Kramatorsk airport and in Mariupol leading to some deaths. But in other areas some soldiers have been defecting to the protesters, either because they support their demands or because they are unwilling to be used to attack civilians in the east. Parts of the security apparatus in the south and east have also gone over to the demonstrators. Seizures of police stations have not been resisted and arms have been handed over. Despite Russia meeting the US, EU and new Ukrainian regime in Geneva on 17 April, the crisis looks set to deepen because the Western side will not discuss Ukraine remaining neutral and the holding of regional referendums. The crisis is unfolding as a result of the US’s relentless push to advance NATO to the borders of Russia. Since 1991 it has been a US priority to bring Ukraine into NATO and break its relations with Russia. In the 1990s this project received the third highest level of US international ‘aid’. As US Assistant Secretary of State Victoria Nuland has confirmed, it has cost the US $5 billion this past 20 years. Over this period the US has orchestrated successive waves of NATO enlargement, moving the alliance’s weapons and infrastructure progressively eastward. In 1999 Hungary, Poland and the Czech Republic joined NATO; in 2004 they were followed by Bulgaria, Estonia, Latvia, Lithuania, Romania, Slovakia and Slovenia; and in 2009 Croatia and Albania joined. The US also aims to add in the former Soviet republics of Georgia, Moldova, Kazakhstan, Armenia, and Azerbaijan. But its next target has been Ukraine, with its 1,400 mile Russian border. Installing US/NATO bases there would tighten a devastating military noose around Russia. Augmenting this eastward advance, NATO stepped up its nuclear capacities around Russia. In 2002 the US withdrew from the Anti-Ballistic Missile Treaty to allow it to introduce missile inceptors (the Missile Defence Shield) that can shoot down nuclear missiles. It has stationed parts of such a system in Eastern Europe and the Black Sea. Despite being dressed up in ‘defensive’ jargon, the explicit aim of this system is to deliver NATO a ‘first strike’ capacity. The Missile Defence Shield would mean any Russian retaliation to a nuclear strike could be prevented from reaching Western targets. When Russia was last attacked from its west in 1941, 27 million people in the USSR died before Germany was defeated (including 14 million Russians). During that conflict Ukraine was the German military’s staging area for attacks into Russia’s heartland. Today NATO wants bases in Ukraine that can host the interceptor system to neuter Russian defences. With NATO tightening its encirclement Russia desperately needs some defensive buffer; either allies or independent countries. Despite the huge intervention by the US and Western Europe, it had not been possible to foist a decisively pro-Western orientation on to Ukraine until now. For the past 23 years Ukraine has maintained its neutrality and this was reinforced by Russian subsidies to its crisis-ridden economy in the form cheap energy. The 2004-05 pro-Western ‘Orange Revolution’, which attempted to turn Ukraine to the West by overturning the 2004 election of pro-Russian Yanukovich, proved unpopular. In 2010 Yanukovich decisively won the Presidential election. This February’s coup removed Yanukovich, and the exposure of his corruption has discredited him. The West is therefore pushing for an early Presidential election – on 25 May – before any alternative pro-Russian candidate or coherent political force can be built up. It effectively rigs the election in favour of a pro-Western candidate. To carry through the parliamentary coup the West assembled a political alliance of pro-Western liberals and Ukrainian far-right nationalists. The latter, being the most determinedly Russophobic (plus pro-fascist, anti-Semitic and anti-gay), organised most of the street fighting in the Kiev protests prior to the coup. The crucial role of Ukraine’s far-right to imperialism’s alliance is understandably downplayed in the West as it is deeply discrediting and undermines its claim to be working with ‘pro-democracy’ forces. But, the new regime imposed in February has since allocated various government posts to far-right leaders, from deputy prime minister to head of defence. It has also created new ‘special’ security units, into which far-right militants have been integrated alongside US supplied mercenaries. These units are loyal to Kiev and can be deployed where rebellion against the coup has extended into the security forces, particularly in the south and east. Yulia Tymoshenko and her Fatherland Party, ousted by Yanukovich in the 2010 elections, have formed an alliance with the neo-Nazi Svoboda to contest the May elections. The Svoboda party was previously called the Social-National Party to explicitly identify it with Hitler’s Nazis. Ukraine’s parliament endorsed significant parts of the far-right’s programme (attacking Russian language rights, banning the Communist Party, involving the far-right in state security and allowing Nazi propaganda) immediately after ousting President Yanukovich; some of the bills it passed are set out in the table below. Although the West persuaded the new regime to retreat on restricting language rights, given the coup government’s clear anti-Russian signals, it was no surprise when over 90 per cent of Crimea voted for it to return to Russia in its 16 March referendum. Following Russian parliamentary approval Crimea then acceded to the Russian Federation – evidently a re-unification by mutual consent, not an ‘annexation’ or ‘invasion’ as wildly claimed by the imperialists. Politically Ukraine is an aggregation of west-orientated and east-orientated territories with their different cultures and languages. The most democratic solution to the crisis would be to allow each region to determine its future. The main demand being raised by the protesters is for a federal solution with significant regional autonomy. Russia is also calling for a federation that respects the polarised orientations within a constitutional framework that enshrines military neutrality. It is not currently demanding separation or further referendums on secession – although such calls might emerge if the Kiev government cracked down on the protests. Russia clearly regards the re-unification with Crimea as a special case as it was until very recently part of Russia. The US, Russia and Germany are themselves federations. If Ukrainian neutrality was guaranteed, Russia argues, a devolved system could be introduced protecting the rights of all populations in all regions. Imperialism is happy to concede Russian language rights, but its offensive to overturn Ukraine’s military neutrality and bring it into NATO will not be abandoned. Huge resources have been spent getting a regime in Kiev that will do the West’s bidding. It is not planning to retreat. The West and Kiev are threatening a military crackdown against the protestors and stepping up the threat to Russia should it move to defend the population in the east. NATO is advancing its military presence: Western troop numbers are increasing; more flights taking place close to Russia; and more warships are arriving in the Black Sea. NATO is also preparing military exercises with the new Ukraine regime. The framework of military agreements between NATO and Russia this past twenty odd years are effectively been torn up, with the US violating both the 1997 NATO-Russian treaty and the Montreux Convention that restricts naval operations in the Black Sea. The West is also attempting to isolate Russia internationally and undermine its economy. Sanctions have been imposed; the G8 has been reduced to the G7, returning to being just a club of imperialists, as it was prior to 1998; various travel bans and asset freezes are being targeted at allies of President Putin; plus economic measures are being proposed against Russia’s energy, mining and financial sectors. The US has to cajole the EU to agree each stage of sanctions, because significant West European interests are at stake in this confrontation with Russia. The EU gets one third of its gas from Russia, the oligarchs deposit their plundered capital in European banks, and major European and British companies – like BP – are heavily invested in Russia. So big business, especially in Britain, is lobbying against tough sanctions. And the claim the US can replace Russia as Europe’s main gas supplier is just wild rhetoric. After 1989 the International Monetary Fund imposed neo-liberal shock therapy across Central and Eastern Europe, imposing massive privatisations, high interest rates to artificially shore up high exchange rates, and financial deregulation. Their economies – especially those of Russia and the Ukraine – were crashed. The current IMF plans for Ukraine are further proposals from the same mould. The proposed IMF ‘loan’ is a financial illusion. A large part of it will go directly to international banks that hold Ukrainian government debt – so Ukraine will owe the IMF instead of these banks. The remainder of the ‘loan’ will be offset by far greater resources taken out of Ukraine under the IMF deal, resulting in an overall negative impact on Ukraine’s economy. Ukraine will lose sovereignty over economic policy, with more public assets and private industries sold off to Western purchasers. The government will be required to cut public services, freeze wages, reduce pensions, raise taxes, and cut subsidies for necessities such as energy prices. A severe austerity programme will slash, already low, living standards. At the same time, further undermining its economic ties to Russia will damage Ukraine. The break-up of the Soviet Union, undermining the intertwined economies of Ukraine and Russia, and the implementation of the IMF restructuring ‘shock therapy’ in the early 1990s delivered a huge blow to Ukrainian living standards, from which they have still not recovered. GDP per capita in 2012 (the most recent year for which figures are available) was still 20.7 per cent below its 1990 level! With the new regime in Kiev turning to the west and seemingly intent on denying democratic rights to the pro-Russian south and east, Russia has little incentive to continue subsidising the country. It is withdrawing the discounts on energy supply, which will further impact on Ukraine’s economy. To justify their support for the coup regime in Kiev, and turn attention away from unpleasant facts like the involvement of Svoboda, it is claimed that Russia is to blame and that it is Russian ‘imperialism’ which is at play in Ukraine. At the beginning of the 20th century, Russia was indeed an imperialist country, although a relatively weak and backward one. Its finance capital creamed off the surplus from its conquered neighbours, which were forcibly integrated into its empire. In the course of the 19th century it had held colonies in Alaska, Hawaii, California, it had seized territory from China and held concessions within it. Russian imperialism was overthrown along with the Tsar by Russia’s 1917 socialist revolution. Following the destruction of the USSR in 1991 capitalism was restored in Russia. But Russian imperialism was not recreated. On the contrary, a large part of Russian manufacturing industry was smashed by competition from the West and its economy was crashed back to becoming primarily a supplier of raw materials. Russia became a capitalist, not an imperialist, state. Moreover it is a capitalist state with significant features of underdevelopment in the predominance of the supply of raw materials in the economy. Its GDP per capita – at $14,800 p.a. – is similar to that of Latin American states like Brazil ($11,300), Venezuela ($12,500), Chile ($15,800), Argentina ($11,800) or Uruguay ($16,600) rather than imperialist countries like the USA ($53,100) or Britain ($39,600). Moreover, imperialism is a structured international economic and political system, guaranteed by the US at its core. Its imperialist partners, like Britain and France, share responsibility for the imposition of imperialist rule through military force, ousting recalcitrant regimes, as they have most recently in the Middle East and Africa. There is no parallel international imperialist organisation from Russia. It is excluded from the club of imperialist countries imposing and maintaining this world order, to which it is subject. It is large and developed enough to periodically struggle against the demands of the US-led imperialist system and therefore is the target of NATO containment. Its regional foreign policy is defensively aimed at maintaining a buffer of neutral states between it and the arsenal of imperialist weaponry targeted at it. Russia has not sought foreign colonies or to dominate semi-colonies abroad. It has asserted the right of Russian populations cut off from Russia itself by the break-up of the Soviet Union to set up autonomous states, demand federal rights, or, in the case of Crimea, to accede back to Russia. Substantial Russian populations are today trapped in enclaves outside of Russia because in 1991, when the USSR disbanded, previously internal borders between its republics were not redrawn as they were transformed into international boundaries. It makes no sense to argue that Russia is an imperialist country. The only argument seriously put forward to defend such a view is its refusal to allow the secession of Chechnya. But even if it is agreed that Russia should allow Chechnya to secede, this would only be evidence that Russia was pursuing a reactionary policy not that it is imperialist. If refusing the right to secede was the only measure of what constitutes imperialism then Sudan was an imperialist country before the secession of South Sudan, or Ethiopia before the secession of Eritrea. Or if invasion of a neighbour was the only measure then Vietnam was imperialist when it occupied Cambodia in 1978. Or if it is just down to carrying out to ‘reactionary acts’, then Chile was imperialist during the bloody repression of Pinochet. Or Egypt is imperialist for closing its borders with Gaza. Some on the left that wrongly describe Russia as imperialist nonetheless raise the slogan that ‘the main enemy is at home’ and therefore orientate to opposing the eastward advance of NATO. But the logical extension of this is that the same slogan should be raised in Russia, where it would mean calling for no resistance to NATO and the US’s advance in Ukraine. Or that Russia should stand aside if the Kiev unleashes repression in the east and south of the country. Or even that the left should call for Crimea to be handed back? While the West – including some sections of the Western left – talk of Russian ‘imperialism’, the semi-colonial world has been much clearer. For example, Argentinean President Kirchner attacked Western hypocrisy on Crimea saying: ‘the UN Charter stipulates the right of people to self-determination, which means that this rule should be applied to all countries without any exception’. Although the vote to condemn the Crimea-Russia reunification in the UN General Assembly was declared a great victory, in fact only 100 of the 193 countries voted for the motion. While only 11 countries voted against, the 82 abstentions and absences, led by China, were a clear indication of refusal to join in the attacks on Russia. Despite the Western media campaign to vilify Russia, isolate it and destroy it through sanctions, it is not without international support. In Britain the Stop the War Coalition is focussing its campaigning against Western intervention and the West’s role in fuelling a new cold war with Russia. Supporting Stop the War Coalition is the vehicle to campaign against NATO, the West’s offensive and the imperialist military build-up on Russia’s border. Alongside this the left needs to campaign for a halt to Kiev’s crackdown in the east, for negotiations and referendums so the regions can determine their own destinies and for the rights of the Russian parts of the population of Ukraine.